Geoff Notkin (left) and Steve Arnold (right) are the stars and hosts of the Science Channel's "Meteorite Men." This picture shows one of their largest and most spectacular finds: A 223- lb pallasite meteorite from the secret "Alpha" site in Kansas. Geoff Notkin is not afraid to camp for days in a barren and scorching-hot desert, or battle tough weather on even tougher terrain. Notkin is a meteorite hunter. He and his partner in crime, Steve Arnold, are the hosts and stars of Meteorite Men, a popular TV show about meteorite experts who hunt for precious space rocks everywhere from abandoned farms in Kansas, to Chile's arid Atacama Desert, to the wide-open Australian Outback. 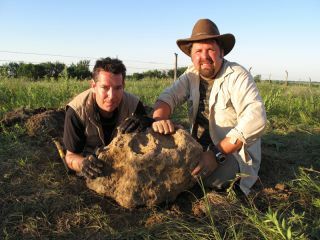 Season three of "Meteorite Men" premieres tonight (Nov. 28) at 10 p.m. EST/PST on Science Channel. The new crop of episodes features the usual blend of adventure, science and humor, as Notkin and Arnold track down meteorites in the United States and abroad. SPACE.com recently caught up with Notkin (fresh off the heels of yet another travel adventure in England) to talk about the upcoming season of "Meteorite Men," why he wants to go to Antarctica, and how you can become a meteorite hunter, too. SPACE.com: With the season three premiere coming up, this must be a very exciting time for you. I'm a huge fan of the original "Star Trek," and I had this revelation one day that "Star Trek" and "Meteorite Men" both made it to three seasons. It's a great feeling to have done all of these things, and I have to thank Science Channel for believing in us and for taking something of a gamble on a very unusual show. Steve Arnold (left) and Geoff Notkin (right) are the hosts of "Meteorite Men" on the Science Channel. SPACE.com: So, what are some things that fans can look forward to in this new season? Notkin: Season three will be comprised of eight new one-hour episodes. We visited some entirely new locations that we'd never been to before. We also revisited a couple of old favorites with new equipment and under new circumstances. In one case, we extraordinarily had permissions, as part of a scientific research project, to hunt in a highly restricted location. An accomplished Canadian meteorite scientist contacted us and said, 'I need help with a project because meteorites are being poached from this unique site — stolen by people sneaking into the site.' He asked if we would help him find all the meteorites before they were stolen. That was definitely a first. I often talk about how important it is to work with academics and to donate significant finds for study, and here we were in this actual race against time. It's the kind of thing someone would dream up and think it would make a good episode, but it was completely real. That was a highlight for me. The first episode of season three was filmed in Poland. I'd never been to Poland. It was another instance in which we were granted almost unprecedented access to a very important scientific site — the Morasko crater field. We worked with local scientists to explore this preserved site using our very high tech metal detectors. I can tell you that we made an amazing discovery. SPACE.com: You certainly travel a lot, but is there somewhere in the world that you're dying to visit that you haven't yet been? SPACE.com: Tell me a little bit about how your interest in meteorites came about. Notkin: It's been almost a lifelong passion for me. I was fortunate enough to have very brilliant parents. My dad is an amateur astronomer, so he was always setting up the telescope when I was growing up. I was inundated, in the best possible way, with astronomy at a very early age. As a five or six-year-old, I had an affinity for rocks and fossils. I was always climbing around in the chalk quarries in southern England. My mother took me to a geological museum when I was about seven, and I was fascinated by the mineral displays and fossils. On the second floor, at the back, there was a meteorite exhibit called the Hall of Meteorites. There were enormous meteorites on display that you could touch. It was a life-changing experience for me. I vividly remember, at the age of seven, standing there in a dark room with my hand on this iron meteorite, trying to fully absorb the fact that it had fallen on our planet from outer space. It seemed almost too large a concept to grasp. I think that wonder has fueled me ever since, and as amazing an experience as it was, it is actually topped by the experience of excavating a meteorite, pulling it out of the ground for the first time. On the show, you get the treasure-hunting part where we search for valuable things, and the scientific wonder part, as well. It's kind of a double rush there when the new meteorites come out of the ground. The stars of "Meteorite Men," Steve Arnold (left) and Geoff Notkin (right) are pictured with their truck, affectionately called "The Mule." SPACE.com: As an amateur astronomer, it must be very surreal for your father to see you on TV as a meteorite hunter. Notkin: He's been fantastically supportive of the whole thing. In an amusing twist, my father, who is a World War II veteran and now lives in Ireland, has become very involved with World War II education groups. He's recently started doing television interviews — he's been on the BBC and done a number of radio interviews and lectures — and he teases me, saying 'I can't let you be the only television star in the family.' So, we've been having this friendly contest. He's a very articulate person and I published a book called Meteorite Hunting, and I dedicated it to him as being the person who first introduced me to the wonder of the night sky. SPACE.com: How has the show evolved over three seasons? Notkin: I think the content of the show has become more sophisticated. And I don't mean that in any negative way about the earlier episodes. We did the first season very quickly and with a smaller budget than the later seasons. All of season one was filmed in North America, and in season two, we got to go to Chile, Sweden and Australia. The visual scope of the show became much more dramatic. In the third season, you're going to see more humor, more science and more travelogue. There were some very interesting local color events that took place while we were filming. I really enjoy that aspect of it. I like the journey, and I like to meet unusual people. SPACE.com: How long have you and Steve known each other? Notkin: We met in person back in 1997, although we had been emailing prior to that. We met kind of by accident on the internet through our shared interest in meteorites. Steve contacted me saying he was planning this expedition to Chile, if I wanted to go. I thought he was joking at first. When my friends found out that I was going to the most dangerous desert in the world with someone I didn't know, they really thought I had gone off the deep end. We said hello face to face for the first time in the airport in Santiago, Chile in 1997. We embarked on this terrifying journey on the Atacama desert and found quite a few meteorites. At the end of it, we discovered not only that we got along really well, and despite having radically different political viewpoints, we have the same birthday. We've been working together ever since. The kind of rapport that we have, the way we goof around, that's exactly who we are. Sometimes when we do public appearances or lectures, people are kind of surprised that these are not characters that we've devised. When you've been working with the same person for 14 years, and you spend a lot of time on the road on boring drives and long flights, we have to figure out a way to entertain each other, or else not say anything at all. The TV show "Meteorite Men" follows the adventures of two meteorite hunters, Geoff Notkin and Steve Arnold, as they track down precious space rocks. SPACE.com: How do you see yourself? Are you a scientist? An adventurer? An educator? Perhaps all of the above? Notkin: I have a science background. I worked as a geologist, and we're both science writers, but I don't have much formal training in this field. I was attracted to it by the wonder of it all, by the genuine amazement that it was conceivable for a man or woman to go out in the desert and find a space rock that is billions of years old and was found by accident. I'm also a photographer, so I'm always looking for an interesting and unusual story for science publications. My writing style is very much first-person narrative. If I'm going to write adventure articles, I need to generate the adventures first, so it's part adventure and part science. We do have this close relationship with some of the leading scientific minds in meteoritics, so it's an opportunity to have a meeting of the minds with our colleagues in academia. We can find out what these meteorites really mean, and if there's something new about the find that can broaden science. So, I'd say we're adventurers first, and then for me, writing and photography are very close seconds, and anything we can bring to the scientific knowledge of our field is a big bonus. SPACE.com: How closely do you work with research organizations or scientists in the field? Like amateur astronomers, are meteorite hunters finding themselves playing more and more inclusive roles in the scientific community? Notkin: Yes, and I'm happy to say so. You have brilliant scientists who have devoted the first half of their lives to accumulating knowledge, and they often have research to do, classes to teach and responsibilities at universities, and don't necessarily have as much time in the field as they would want. I feel that people, such as Steve and myself, can compliment that. We want to be in the field all the time. When we make an important discovery, donating some of it to science is just the right thing to do. On the other hand, from a practical standpoint, if a lab analysis reveals something new and exciting about a meteorite, we all benefit. That discovery will go into the scientific literature, and the find will be worth more money. I like to think that we go out to do the field work and give it to scientists to do the lab work. SPACE.com: How has meteorite hunting changed over the years? Notkin: When I got into the field in the mid-90s, there was just a handful of non-academics who were looking for, buying, selling and trading meteorites. Now there are hundreds or thousands of part-time hunters or enthusiasts. There are probably around 10 commercial dealers worldwide. I always find amazement from people, who aren't in the field, that it's actually legal and relatively easy to own a meteorite. That was not true in the '60s and '70s. Most of them were in institutions for study. I think the improvements in technology have allowed for the construction of better metal detectors and better four-wheel drive vehicles. Also, the preponderance of meteorites on the internet has made people realize that they can do it, and it has given them the ability to do it. The advances in metal detector design in the past 40 years have been phenomenal. There's new and better equipment coming out every day. We've gone back to sites we've already hunted well, and with better equipment, we've found more meteorites. SPACE.com: Is meteorite hunting something that anyone can do, or do you need a lot of expertise or equipment? Notkin: It depends how you want to go about it. If an enthusiast says to me, "I really want to find one small meteorite, just so I know I've done it. How can I do that?" I would say: find the driest, most remote lakebed you can, and walk around. The vast majority of meteorites are tiny — marble-sized or smaller. If you have really good eyes and put the time in, chances are, if you live in an area like the American southwest, it's doable. It may take hundreds of hours, but it's doable. Someone who wants to go the tech route and use detectors, then you really have to do your research. If you want to make a living by doing this, then there's a considerable investment in equipment. But, it's doable. Any determined person who wants to put in the time, effort and money could conceivably find a meteorite, and maybe a really nice one. "Meteorite Men" Geoff Notkin and Steve Arnold navigate around in an amphibious vehicle. The guys affectionately call their go-anywhere Hydratrek "The Rockhound," and it really does go anywhere. SPACE.com: From what you can tell, have more people become interested in meteorite hunting than when you first started? Notkin: In the '90s, I must have known almost everyone in the field personally. Now, there are literally hundreds of part time hunters, maybe thousands. I moderate a meteorite forum called Club Space Rock, which is a free forum for exchange of information. There are 2,300 members worldwide, and many of them are part time hunters. This remarkable field was of interest to only a tiny number of people 20 years ago, and now it's grown tremendously in popularity. SPACE.com: Why do you think that is? Notkin: It's due to a number of things. Our show has increased the popularity, but so has the internet. Before, there was no easy way to meet other people who were interested in meteorites unless you were in academia. There was no club that I was aware of, and occasionally you would meet someone at an astronomy event. Now, the popularity of the hobby has just grown to an amazing degree. SPACE.com: How is the worth of a meteorite determined? Notkin: In terms of value, like most collectibles, the monetary value is at least partially determined by rarity. For example, the Canyon Diablo Iron, which is associated with the remarkable meteor crater here in Arizona, is one of the most widely available meteorites in the world, simply because it's a giant crater and many thousands of pieces have been found since it was first discovered in the 1800s. Collecting is no longer allowed there, so they're not actually as abundant as they once were. We sell meteorites by weight, using the metric system. The perceived value of a Canyon Diablo is 75 cents to a dollar per gram. Let's say I'm interested in something less abundant, like from the Henbury crater field in Australia. It's also quite difficult to export meteorites from Australia, so Henbury meteorites would typically be worth three or four times a Canyon Diablo. And then, both the condition and the aesthetic quality of a specimen will factor into it. For example, did the piece break when it landed, or is it a beautiful, complete piece with no damage? Iron meteorites, which have a spectacular shape, are very desirable to collectors. As are, strangely enough, meteorites that have hit a manmade object. So, a meteorite called Peekskill that hit a car in upstate New York is one of the most collectible meteorites. It has a place in history. There will never be another piece that hits that car in that driveway. It was a large and nearly perfect stone, so it has since been cut up and distributed to collectors and museums worldwide. So, there are a number of factors: rarity, beauty, whether it has an interesting story attached to it, whether it was found under unusual circumstances. That whole idea of a documented meteorite event, which we call a witnessed fall, is of great interest to collectors. Some meteorite collectors only want witnessed falls, as opposed to meteorites that are found in the desert, for instance. There's a lot of factors that play into determining the value of a meteorite. Some of my favorite meteorites in my personal collection are actually quite common. They're just pieces that I found myself that are of particular interest to me. I'm a collector and a genuine enthusiast. It was a love of meteorites that got me into this, and at no point in my life did I say: meteorites would be a great way to make a living. SPACE.com: So, how many meteorites do you have in your personal collection? Notkin: A lot. I would say a few hundred. The smallest piece in my collection is about a gram, so not much bigger than the head of a pin. The largest piece is 150 pounds (68 kilograms). SPACE.com: Why is it important to study meteorites? Are you excited about the prospect of a sample return mission to an asteroid? Notkin: The study of meteorites has helped us understand the makeup of some asteroids, and with at least some of the larger ones, we think we have a fairly good idea what they look like. I think one of the most fascinating aspects of contemporary space exploration is studying the asteroid belt, all those different bodies out there with their different makeups. This is purely hypothetical, but if sample return missions to the asteroid belt were so commonplace that asteroid material became abundant on Earth — let's say a private sector company sent a rover to one of the main belt asteroids and brought back 10 tons of asteroid material and sold it, would that reduce the value of meteorites that have fallen to Earth? I think the answer is no. Meteorites are very much a product of their journey through our atmosphere. They're always going to ultimately be different than virgin material. But, that wouldn't mean I wouldn’t want both. They would make a very nice pair.